At the height of production 1200 to 1500 quarts of malt were produced a year and 300 barrels of beer per week. There were spacious growing floors and a good sized reservoir at the rear of the building to provide water for the boiler. A familiar entry in the carnival procession used to be the Brewery Steam (Mann) Wagon (1902 to 1911) with the registration number Y146. 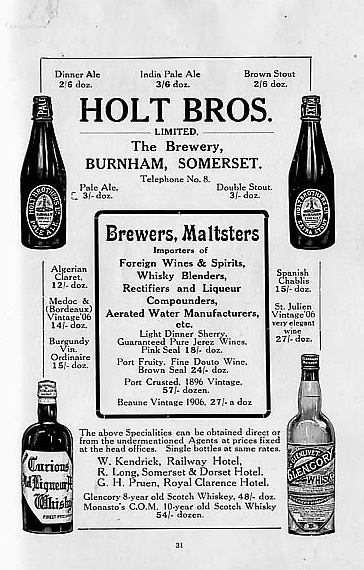 Beer was initially delivered to the ninety Holt pubs by horse and dray. All the pubs in Burnham , except the Crown in Oxford Street, belonged to Holts. Advertisement from Burnham on Sea Golf Handbook, date unknown. In 1957 Starkey, Knight & Ford bought the business from Tom Holt but were themselves taken over by Whitbreads in 1962. Following successful planning permission in 1965 the site was developed and is now where Broadhurst Gardens, and the Lighthouse Pub is. See More about this location. There are several of these types of glass bottles to be found at car boots and charity shops. It is difficult to age them except to say the glass marble/stopper type was among the earliest. So the best I can come up with is that in 1878 the Brewery was purchase by W.S. Holt and his family ran the business until 1957 when it was taken over by Starkey, Knight & Ford. In December 1965 planning permission was granted and that is now where part of Broadhurst Gardens are. Thanks for sharing your memories with us. When the Brewery closed I used to fish in the pond which was located near by where the Lighthouse Pub car park is now. My parents moved to Burnham in 1948. My father initially taught in the Technical School before King Alfred School opened. When he retired in the 1980’s he became very active in researching Local History and it was only after his passing in 2009 that I found his collection of archives that I too became interested in the history of Burnham and Highbridge. Please see our Programme of meetings on the ‘about page’ if you are interested in attending.